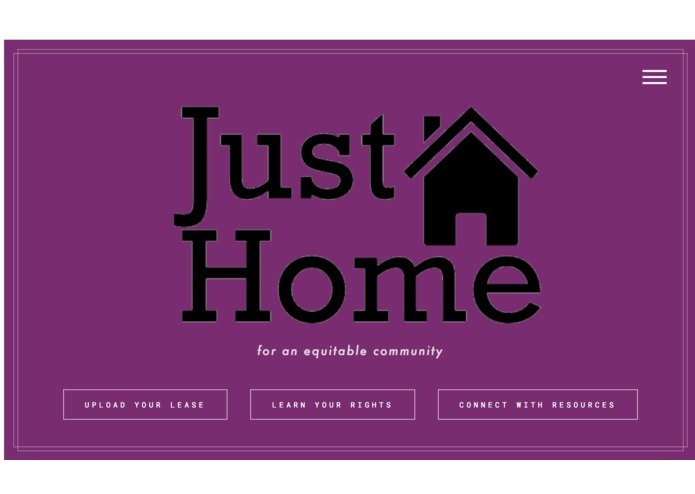 We were inspired to pursue this project because of volunteer experiences that members of our team have had with a student-run housing clinic at a community non-profit near our university (WATCH CDC). We have seen firsthand the struggles that many local tenants are facing, and the great importance of making information available and accessible to tenants. Many local low-income, minority, and immigrant households struggle with housing, are not aware of their rights, and are exploited by landlords and treated unfairly. 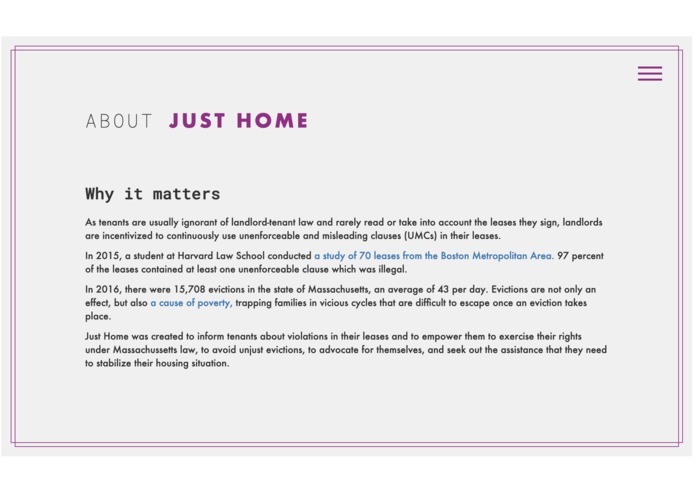 We built this website intending for it to serve as a safe first step wherein Massachusetts and Boston-area tenants can learn about the rights they are entitled to, understand their lease in simpler terms, and become informed of the many external resources that are there to support them. 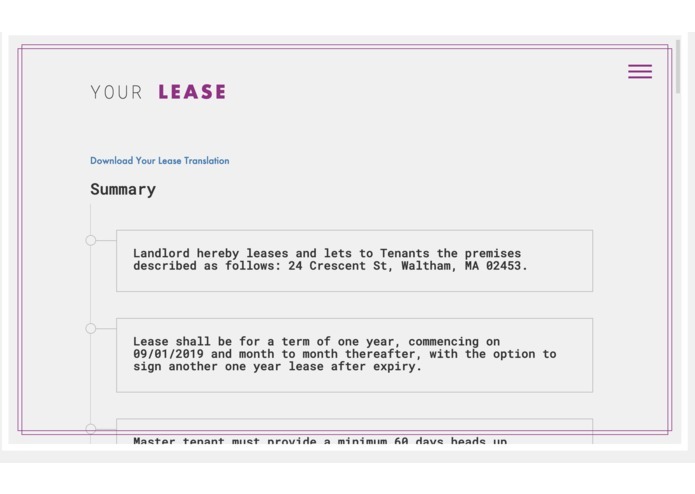 The app allows users to upload a copy of their lease, translate it, summarize it, and check if there are any unenforceable/illegal clauses in it. 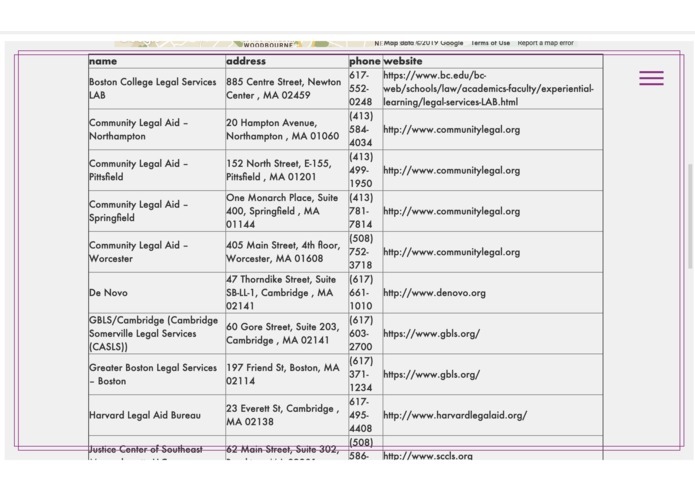 It also gives users information on local legal aid resources so that they can seek appropriate assistance and advocate for themselves to avoid unjust rent payments, eviction, or other unfavorable housing situations. First, we spent a long time setting up a MongoDB database for the Django app that we didn’t end up needing (we are still able to store uploaded pdfs without it). We struggled with natural language processing (nltk) in ways we didn’t anticipate, and were not able to build complex models because of very limited data (leases are not publicly available — all of the ones we found online were just sample leases with blank spaces in them). We also struggled a lot with taking in an uploaded pdf via the web app and returning the appropriate information (we couldn’t figure out how to transfer it to a new page, and where to store it). Ultimately we were not able to accomplish our end goal, which was to build a web app which could upload and interpret the lease. We instead had code that could upload and interpret the lease via command line, and a web app, but the functionalities were not fully integrated with each other. All of the separate parts of the project are functional! On the command line (via the readpdf.py program) we can upload a pdf, extract text, and output a file which contains a summary and possible lease violations. We can also translate a pdf through the command line. The website looks nice and we think it is enjoyable and relatively simple to navigate. We are implementing an interesting summarizing algorithm called TextRank (based on PageRank) wherein sentences which are most similar to lots of other sentences are ranked higher and more likely to be included in a summary. We learned wireframe technology like Sketch. Also, none of us had had experience with Django and half of us had never used Python before today, so we are proud to have taken risks and learned along the way, even if we weren’t able to accomplish all that we had planned. We are proud of how far we got and the effort invested in a cause we strongly believe in. We learned a lot about Python and Django! We learned that identifying similarity of phrases and picking out seemingly “illegal” clauses is a much harder problem that we anticipated. We learned that it is better to focus in deeply on one problem than to branch out too far (initially we had planned to build an app with lots of tools to help tenants, but we are glad that we were able to dive in deep to this specific problem in the time that we had). We learned that asking for help when you need it is really important (and are very very grateful to all the mentors who helped us along the way). We hope to get the website fully functioning, with the back-end stitched to the front-end and leases able to be interpreted through the web interface. 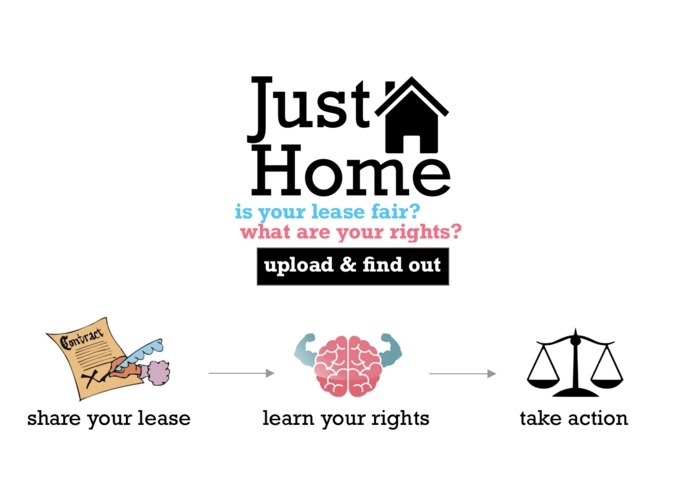 We also hope to expand the platform into an all-inclusive tenant education platform, so that tenants can rate landlords (and discriminatory/exploitative landlords are therefore held accountable), as well as take a quiz on their apartment conditions and receive information about if there are any health and safety violations in their apartment.